This is a great sketch to use inchies. 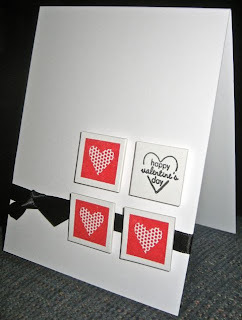 I stamped the dotted heart image from PTI Sign Language on 3 Inchie squares and the happy valentines day heart from PTI Tiny Treats - Valentine set on a 4th Inchie square. The squares are mounted with foam tape. I love inchies! Great CAS card with lots of impact!! Love this!Love your colors and how you placed the sentiment!